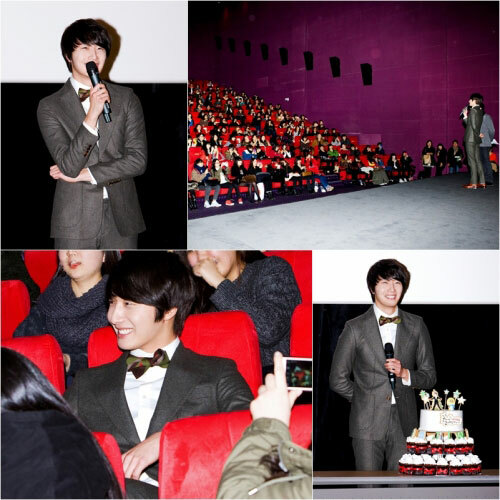 On December 20th, 2011, actor Jung Il Woo was watching the final episode of Flower Boy Ramen Shop with fans. In order to be able to watch the final episode of tvN’s Flower Boy Ramyun Shop with fans, Jung Il Woo had personally selected the CGV theater, and made various preparation. During the event, Jung Il Woo expressed his thoughts, “Because of love and support of fans, so the filming went smoothly until the end, and ended successfully. Hope that everybody can continue to support me in future. After the end of broadcast, Jung Il Woo went on stage and answered questions from his fans and gave out posters and still cuts of the drama with autographs to lucky fans. He also gave away his ramen shop uniform wore in the drama to a lucky fan through a lottery, and shared hugs with all fans who won the lottery to commemorate the end of drama, spending a meaningful time. Then he continued, “In addition, with the intention of still together with Jung Il Woo in 2012, I also prepared a desk calendar with my photo,” gifting a surprise gift of desk calendar to fans.